Construction has begun on the first 2 of 16 schools! community and world better than you found it." 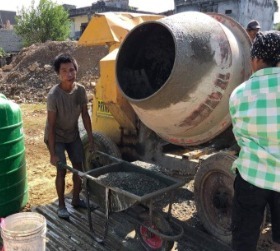 New projects in Nepal are underway as local residents began clearing out rubble and laying foundations to support rebuild efforts! 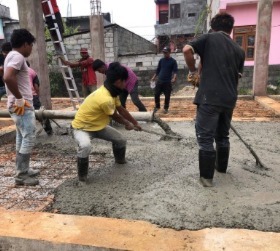 Since early September, the teams in Nepal have been working on the first two of 16 schools that the Young Living Foundation has committed to rebuilding and restoring: the Panchamunidev and Janakalyan Secondary Community Schools. Together these facilities educate over 2,500 students with plans to expand to allow an additional 700 combined students after restoration efforts are completed. The Panchamunidev school is a kindergarten through 12th grade traditional and trade school which lost a large section to the 2015 earthquakes in Nepal. 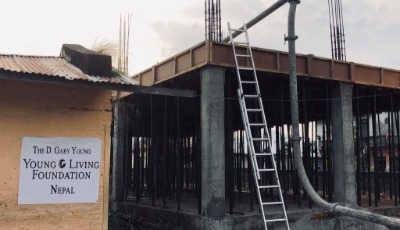 Since September, 17 citizens of Nepal—10 volunteers supplied by the school and seven individuals paid by the Young Living Foundation—have finished demolition and removal of the original damaged structure and have laid the foundation and pillars which will be home to 16 rooms including a science lab and animal science lab, and boys’ and girls’ restrooms. 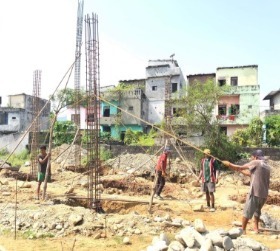 At the Janakalyan school, a kindergarten through 10th grade institution, construction is underway for rebuilding 4 rooms with facilities including a boys’ and girls’ restroom. The school, with parents and teachers donating their own time and money, had already laid the foundation and built the pillars for the destroyed classrooms. But they quickly ran out of funds and couldn’t move forward. That’s when the Young Living Foundation came in to work on finishing off the first floor and building upwards to prepare for building out the second floor. Five volunteers are working tirelessly supplied by the school, and the Foundation is supporting four workers. Stay tuned to Facebook, Instagram, and the Blog as we reveal status updates and the completed product on these two schools!